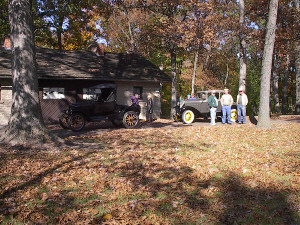 The October meeting was held at Jack Putnam's shop in Bluffton. Bob Torbet led the short meeting with 11 members and friends in attendance. The treasurers report was read and approved. Bob Torbet is planning a one day tour on the third weekend in October. It will likely be centered out of Lima. We all had a chance to talked about the great time we had on the island tour. Everyone agreed that the ride in the antique airplane was a true unexpected highlight of the weekend. Most of the problems that a few of the cars had during the weekend have already been fixed. After the meeting everyone enjoyed a time of fellowship. Jack has recently acquired an auxiliary Chicago over and under transmission. He had it all cleaned up; so, we had a chance to look at its guts. It has been suggested that these things are a little on the noisy side. Only time will tell. A drive shaft will need to be shortened and the tube modified to allow for the addition of the auxiliary transmission behind the hogshead. Bob Hollister brought in a fan pulley that wouldn't adjust properly. 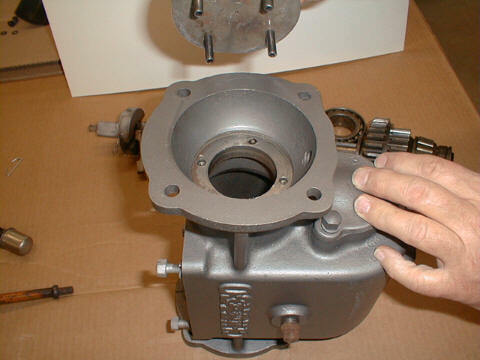 A little machining was performed to take the tension off of the hub when the connecting bolt was tightened. Jack mentioned that, as always, we are looking for winter projects to get as many T's as possible back on the road this spring. We can either work in your garage or take it to Jack's. We have performed some rather major repairs in the past within a couple of day's. Dave Benny's car was a real exception. He will even admit to that. 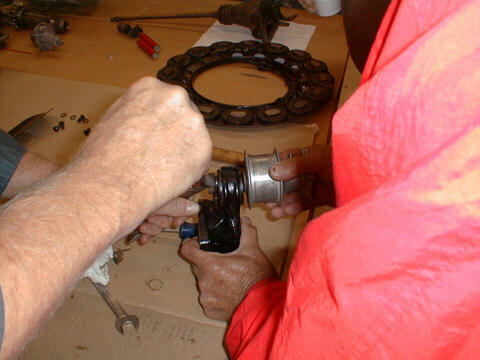 We will get with you on the needed parts or special tools that will be needed for the repair. If you are venturing into a major overhaul, start early this fall. We've all been in on a conversation where someone chimes in, "I remember that 19** car that I had. I wish I would have hung on to that one". Well, I drove the 16 to a family get together recently and gave my great Uncle Arthur a thrill. 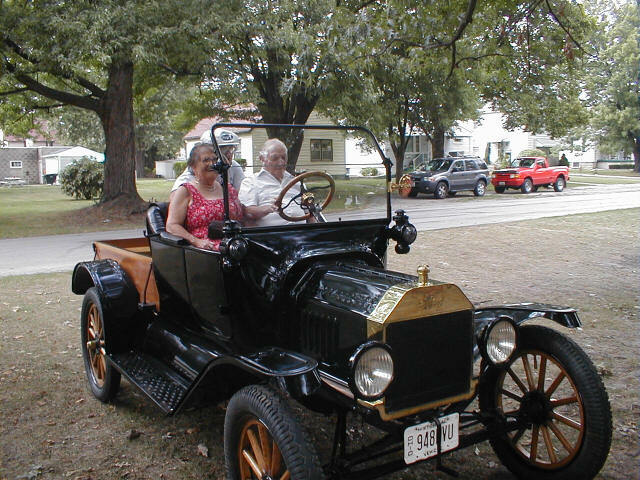 He hadn't driven a Model T in 60 years. So, I sat behind him while he acclimated himself to the pedals and throttle. In no time, we were out on the road and tooling around town in "Old Henry". The picture to the left shows Uncle Arthur and Aunt Mary ready for the ride during their 65th wedding anniversary celebration. Bill Seiberg and Bob Hollister spent a good amount of time at the October meeting fine tuning the fan hub for Bob's coupe . The trick is to get the hub to tighten down enough to not shift with the vibration of the motor and at the same time to be free enough to spin without drawing too much power away from the drive train. There's also the problem of grease. Too thin a grease will come flying out the back of the bushing and too heavy a grease will bog down the fan. Modern cars have gotten away from these problmes by creating stand alone subassemblies that are thrown away and replaced when they get out of adjustmet. Those of us that like to tinker prefer the older cars for their simplicity and fixability. Is that a word??? The Chicago over and under auxiliary transmission was produced in Bryan, Ohio (figure that one out). 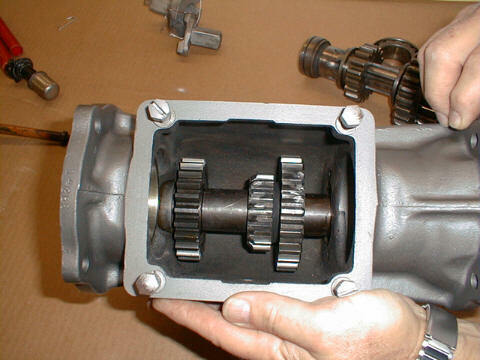 It conneted directly behind the standard transmission where the universal joint would normally reside. 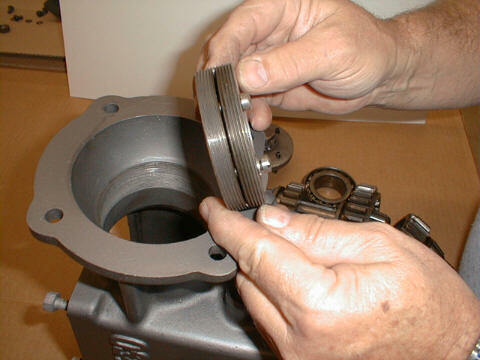 As a result the drive shaft and torque tube must be shortened. All of this changes the angle of the driveshaft and puts a little more stress on the joints of the universal. The pictures are here for your amusement. We will take more pictures and describe what you are seeing if there is any interest in a technical description of the rebuild. 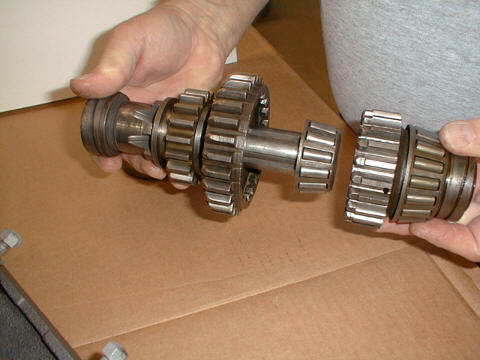 Here we see the subassembly of the gear set. 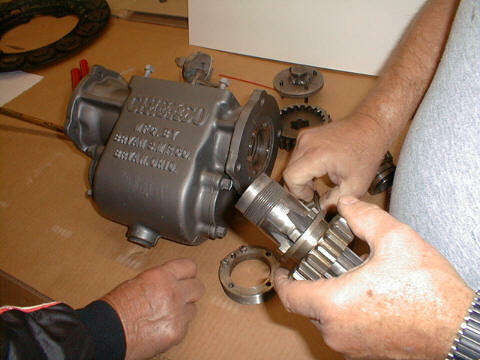 The bottom gears are set in place by sliding first one end and then the other into the casing. The 60 mile tour on the 3rd weekend in October was held under a wonderful sunny autumn sky. While the attendance was a little low, at least the group is now into a little more active touring. This is the best way to keep these cars roadworthy. 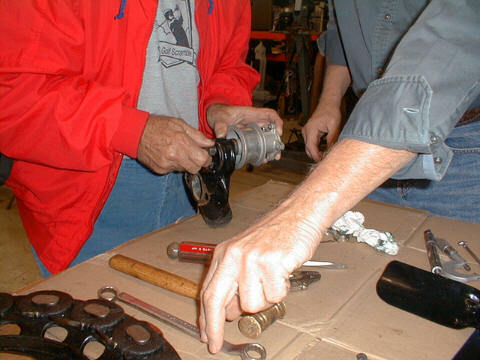 There isn't an old worn out part on a T that can't be fixed once it is identified. This particular tour did not turn up any of those problems. Though it did give the drivers a little more Model T driving experience and confidence. One of the rest stops was at Fort Amanda. The picture to the right shows the guys stretching their legs next to one of the coupes and one of the roadsters. I just love the look of the varnished spokes. They aren't the way Henry Ford made them; but then, it is a shame to hide that beautiful wood grain. The tour ended at the Torbet's home in Lima. A wonderful meal was prpared. 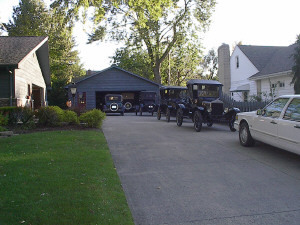 I'm thinking that the neighbors are getting used to seeing a multitude of strange autos in Bob's driveway. The weather is becoming a little cold to be touring in Model T's; so, it's time to concentrate on those T's that need to be brought up to touring standards. 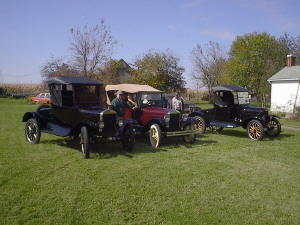 Ask any one of the drivers that drove this tour, the Model T driveing experience is just plain FUN!!! With the arrival of winter, we will be looking for projects to work on while it is too cold and treacherous to drive Model T's around. If you have a project that needs to be completed on your T, let us know and the group will help get your T back into tip top shape. Mechanically we can help. Painting and body work take a little more time. If you have a heated area to work in, a few of us will even spend an evening sanding that final primer coat. "You provide the beverages and eats"" Dancing girls would even be nice.